Much as in the discipline of art history, the history of fashion has tended to focus on the stories and output of great designers, or the artists of our field. The privileging of these so-called “hemline histories,” however, has problematically been at the expense of stories that recount everyday dress practices and the fashion histories of the marginal, the non-Western and, perhaps most importantly, the non-White. Speaking to this point, in a recent AHTR post my colleague and friend Kimberly Jenkins discussed how she has sought to unravel this bias through her digital humanities project, The Fashion and Race Database. By addressing “the intersection of power, privilege, representation, and aesthetics within the fashion system,” Kimberly wants to reconcile fashion’s “partisan,” and I would argue racist, worldview by making freely available a curated collection of documents, traces, and commentaries on the intersections of fashion and race. Kimberly’s project could not be more apt or timely. First during my M.A. at Parsons School of Design, The New School and later during my Ph.D. at the Centre for Fashion Studies at Stockholm University, I became all too familiar with the biases and blind spots that pervade the fashion literature. 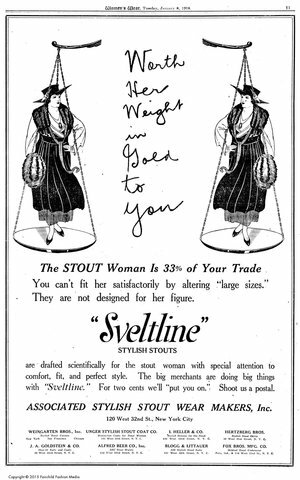 In seeking to reconstruct the early history of “plus-size” fashion—or what in the early twentieth century was charmingly known as “stoutwear”—I realized quite early on that I would face an uphill battle. While the future of plus-size fashion has become the subject of near endless debate as brands are slowly waking up to the fact that it’s a $21 billion missed opportunity, its past has gone largely unacknowledged. While I had discovered an elusive “gap” in the scholarship, I was not, however, entirely prepared for the extent to which the fat, female body had been written out of fashion’s histories. Some might consider fat a marginal identity category that is reclaimed by only a few on the radical fringe. Having no interest group worthy of note, fat is not a category worthy of critique, such academics might assume. Others might mistakenly consider fat a natural category that is merely descriptive and thus not to be considered with a critical eye. Others are perhaps simply too invested in the norm of thinness and the contemporary views of health to be able to interrogate the operations of power therein (2010: 1). The absence of studies of fat and fatness within the academic literature may therefore in part be attributed to private stigmas and prejudices held by scholars who struggle to understand fatness as anything but an incontrovertible public health hazard. Thus, even as fashion scholars have sought to foreground and re-activate overlooked and marginalized histories, a history of large-size dress and studies of the dress practices of fat women may have seemed off-limits for academic inquiry. Although the field of fashion studies has historically encouraged incisive, curious and critical approaches to the study of fashion, it is not entirely unaffected by the fashion industry’s hierarchies and value systems. Indeed, within academia, but specifically within fashion studies, fat is perhaps the other “F-Word” (Steele 1991). The term “plus size fashion” didn’t come into use until the 1980s. 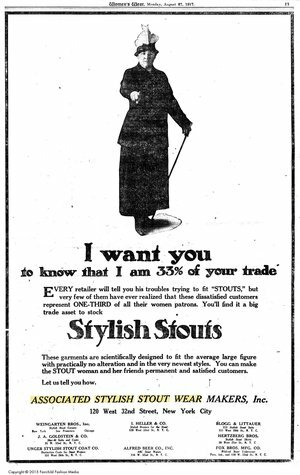 In the early 20th century, it was referred to as ‘stout wear,’ and the woman was referred to as a ‘stout woman.’ But, those weren’t neutral terms in their time, either and sparked active debate. Second, the material record of large-size women’s dress is scanty at best, and non-existent at worst. Indeed, a survey of historical fashion and costume collections yields little insight into the dress practices of larger women since these objects simply have not been collected or conserved, or, conversely, have been misinterpreted. This lack is due to a number of institutional, political and practical reasons, which underscore the fact that the archive is a space of power and a microcosm of social and cultural values. By turn, this material absence has led, quite problematically, to a deeply entrenched survival bias within fashion and costume collections, which has only recently begun to be redressed via a number of notable exhibitions, such as Associate Curator at the Museum at F.I.T. Emma McClendon’s exhibition, The Body: Fashion & Physique. In spite of fashion’s bias against fat bodies, I nevertheless managed to complete and successfully defend my dissertation titled “Stoutwear and the Discourses of Disorder: Constructing the Fat, Female Body in American Fashion in the Age of Standardization, 1915-193” in May 2018, which is available to download and read in its entirety via Stockholm University’s library. In order to complete this research, I adopted Michel Foucault’s archaeological method, or a method of looking for traces of the fat, female body in places that tend to be overlooked by fashion historians, such as trade journals, style guides and historical fashion textbooks. For my secondary research, I similarly adopted a method of reading alongside the few published cultural histories of fatness, which tend to frame fashion as frivolous and ancillary to the history of the fat body, and in parallel to extant histories of Western fashion, which as has already been discussed have neglected the fat body. By embracing these gaps and absences, as well as the inherently interdisciplinary nature of fashion studies, I adopted what Charlotte Nicklas and Annabella Pollen have described an “ad hoc” approach adopted by many fashion scholars who are turning evermore “to unusual or unresearched historical sources…[reflecting] the convulsions that history, as a discipline has undergone in recent decades” (2015: 2). Armstrong, Tim. “Disciplining the Corpus: Henry James and Fletcherism.” In American Bodies: Cultural Histories of the Physique, edited by Tim Armstrong, 101-119. New York: New York University Press, 1996. Arthurs, Jane. “Revolting Women: The Body in Comic Performance.” In Women’s Bodies: Discipline and Transgression, edited by Jane Arthurs and Jean Grimshaw, 137-155. London: Cassell, 1999. Carden-Coyne, Ana and Christopher E. Forth, eds. Cultures of the Abdomen: Diet, Digestion, and Fat in the Modern World. New York: Palgrave MacMillan, 2005. Farrell, Amy Erdman. Fat Shame: Stigma and the Fat Body in American Culture. New York: New York University Press, 2011. Gilman, Sander L. Fat: A Cultural History of Obesity. Cambridge: Polity, 2008. Keist, C. N. “How stout women were left out of high fashion: An early twentieth-century perspective,” Fashion, Style and Popular Culture, 5, no. 1 (2018): 25-40. Klein, Richard. “Fat Beauty.” In Bodies out of Bounds: Fatness and Transgression, edited by Jana Evans Braziel and Kathleen LeBesco, 19-38. Berkeley: University of California Press, 2001. LeBesco, Kathleen. Revolting Bodies: The Struggle to Redefine Fat Identity. Amherst: University of Massachusetts Press, 2004. Levy-Navarro, Elena, ed. Historicizing Fat in Anglo-American Culture. Columbus: The Ohio State University Press, 2010. Schwartz, Hillel. Never Satisfied: A Cultural History of Diets, Fantasies and Fat. New York: The Free Press, 1986. Stearns, Peter. Fat History: Bodies and Beauty in the Modern West.New York: New York University Press, 1997. Vigarello, Georges. The Metamorphoses of Fat: A History of Obesity.Translated by C. Jon Delogu. New York: Columbia University Press, 2013. Women’s Relationships with their Clothes, edited by Ali Guy, Eileen Green and Maura Banim, 39-53. Oxford: Berg, 2001. Almond, Kevin. “Fashionably Voluptuous: Repackaging the Fuller-Sized Figure.” Fashion Theory 17, no. 2 (2013): 197-222. Banner, Lois. American Beauty: A Social History…Through Two Centuries of the American Idea, Ideal, and Image of the Beautiful Woman. Los Angeles: Figueroa Press, 2005. Bayle-Loudet, Aurore. “The Corset, Essential Protagonist of Modern Femininity.” In Fashioning the Body: An Intimate History of the Silhouette, edited by Denis Bruna, 159-176. New Haven: Yale University Press, 2015. Best, Sue. “Foundations of Femininity: Berlei Corsets and the (un)making of the Modern Body.” Continuum5, no. 1 (1991): 191-214. Gamman, Lorraine. “Female Slenderness and the Case of Perverse Complaint Deception—or Why Size Matters….” In Fashion Cultures Revisited: Theories, Explorations and Analysis, edited by Stella Bruzzi and Pamela Church Gibson, 296-304. London: Routledge, 2013. Peters, Lauren Downing. “‘Fashion Plus’: Pose and the Plus-Size Body in Vogue, 1986-1988.” Fashion Theory21, no. 2 (2017): 175-199. _____. “You Are What You Wear: How Fashion Figures in Fat Identity Formation.” Fashion Theory 18, no. 1 (2014): 45-72. Bordo, Susan. Unbearable Weight: Feminism, Western Culture and the Body. Berkeley: University of California Press, 2003. Cavallaro, Dani and Alexandra Warwick. Fashioning the Frame: Boundaries, Dress and the Body.Oxford: Berg, 1998. Entwistle, Joanne. The Fashioned Body. 2nded. Cambridge: Polity, 2015. Fahs, Breanne. “Mapping ‘Gross’ Bodies: The Regulatory Politics of Disgust.” In Aesthetic Labor: Rethinking Beauty Politics in Neoliberalism, edited by Ana Elias, Rosalind Gill and Christina Scharff, 83-100. London: Palgrave, 2017. Featherstone, Mike. “The Body in Consumer Culture.” Theory, Culture & Society 1, no. 1 (1982): 18-33. Porter, Roy. “History of the Body.” In New Perspectives on Historical Writing, edited by Peter Burke, 207-232. Cambridge: Polity, 1991. Turner, Bryan S. “The Discourse of Diet.” Theory, Culture & Society 1, no. 1 (1982): 23-32. Clothing: Developing Effective Sizing Systems for Ready-to-Wear Clothing, edited by Susan P. Ashdown, 1-48. Cambridge: Woodhead, 2007. Ashdown, Susan P. “Creation of Ready-Made Clothing: The Development and Future of Sizing Systems.” In Designing Apparel for Consumers: The Impact of Body Shape and Size, edited by Marie-Eve Faust and Serge Carrier, 17-34. Cambridge: Woodhead, 2014. Chun-Yoon, Jongsuck and Cynthia R. Jasper. “Development of Size Labelling Systems for Women’s Garments.” Journal of Consumer Studies and Home Economics18, no. 1 (1994): 71-83. Czerniawski, Amanda. “From Average to Ideal: The Evolution of the Height and Weight Table in the United States, 1836-1943.” Social Science History31, no. 2 (2007): 273-296. Jeacle, Ingrid. “Accounting and the Construction of the Standard Body.” Accounting Organizations and Society 28, no.1 (2003): 357-377. Lewis, Van Dyk. “Sizing and Clothing Aesthetics.” In Sizing in Clothing: Developing Effective Sizing Systems for Ready-to-Wear Clothing, edited by Susan P. Ashdown, 309-346. Manchester: Woodhead, 2007. Levy-Navarro, Elena. “Introduction: Changing Conceptions of the Fat Body in Western History.” In Historicizing Fat in Anglo-American Culture, edited by Elena Levy-Navarro, 1-18. Columbus: The Ohio State University Press, 2010. Nicklas, Charlotte and Annabella Pollen. “Introduction: Dress History Now: Terms, Themes and Tools.” In Dress History: New Directions in Theory and Practice, edited by Charlotte Nicklas and Annabella Pollen, 1-14. London: Bloomsbury, 2015. Steele, Valerie. “The F Word.” Lingua Franca (April 1991) 17-20. About time. Looking forward to the book – congratulations! What a terrific post. I teach an upper division course on Body, Fashion, and Identity in an art and design college with a lot of fashion majors. Issues of the fat body…bodies in general…are not really addressed in studio courses so your bib is going to be a great asset.